Our family is beyond grateful to God for His beautiful power in the midst of this trial. 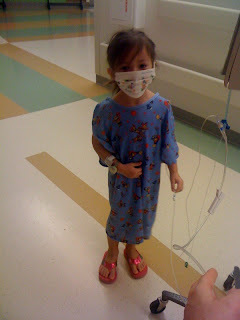 We are also so grateful for the many of you who have prayed with great supplication on Lily's behalf. Sweet lily could walk today! She wasn't able to walk with out a lot of pain until this morning... We were nervous it was a pinched nerve from the lumbar puncture but she walked two loops around the halls this morning! She actually can't walk again at the moment, but they think it's just inflamed so they will give her inflammatory medicines but thank the Lord it's not her nerve. The cultures came back negative today for Bacterial Meningitis. Thank you sweet Jesus. Thanks for your prayers on Lily's behalf. We love you guys! Hello all... Some have asked about her walking... Well we're home now (Hallelujah). They gave her some medicines for inflammation this morning (Thank our God for 'Mac Mac'- her grandpa in Uganda... He diagnosed it all the way across the world ;) ... I always have heard he's one of the best doctors... Seriously... 'King of the Bush Doctor's'). Lily Parker did well after the medicines but then I guess it flares up again and then she can't walk... When she got home she wasn't able to walk but she is resting now... That is probably what she needs... Some shut eye. ;) Thank you for continuing to pray for her! I know His hand is on her. I so hate to see little ones in so much pain. That poor little girl. We will continue to pray for Lily and what a beautiful name that is.